Author facilitating a conditional marriage. Photo courtesy of Rachel Sacks-Davis. The status of a human as an acquisition, that is surely not acceptable to me, and the fact that it’s not mutual, that the man acquires the woman . . . and of course all the problems that come after— that a woman can’t divorce, and that if she is unfaithful her children are “mamzerim.” This is terroristic rule of women’s sexuality that is not applied to men. I don’t think it is healthy at all for a couple to live with the awareness of power relations such as these. I find kiddushin humiliating. The kiddushin itself humiliates me. It humiliates me in a deep way and represents everything I oppose in my whole being. And what was so hard for me—I can cry just thinking about it—that here I am, at the moment that would be so important to me going to stand in a public way in front of everyone who I love and who is important to me, and I am going to allow halakah to relate to me in a way that I think is forbidden for anyone to relate to a woman ever! “Proceed with caution!” I responded. And I wasn’t joking. Kiddushin, and the acquisition of the woman by the man that it entails, is a dangerous enterprise. The current nonreciprocal model of kiddushin is not an appropriate contract for a relationship between equals. Many, if not, most women would not agree to such a relationship if they knew what it entailed. Other women who know what it entails, (such as those quoted above from Koren, You Are Hereby Renewed Unto Me: Gender, Religion and Power Relations in the Jewish Wedding Ritual [Magnes Press, 2011], 110 and 111 respectively; my translations) enter into such agreements for a range of complex and difficult reasons not within the scope of this essay. In addition to the inequality of the structure and formation of the relationship, the possibility of a woman being stranded in a marriage because of a recalcitrant husband is a risk that no Jewish woman should be forced to take in the twenty-first century. My recently published book Tradition and Equality in Jewish Marriage: Beyond the Sanctification of Subordination (Continuum, 2012) explores two particular alternative forms of “marriage” in the Jewish tradition, namely conditional marriage and Derekh Kiddushin. First, I discuss conditional marriage where the marriage is conditional on the husband not to withhold a get. In the event that he does withhold a get, after a specified period then the marriage is considered retroactively nullified. After civil divorce was introduced in French courts in 1884, French Jews were concerned about Jewish women getting divorced civilly and then remarrying without a Jewish divorce. They received permission from Rabbi Eliyahu Hazan, the Chief Rabbi of Alexandria, to introduce conditional marriage, in order to overcome the dangers they foresaw. This prompted great consternation from many European rabbis, which culminated in 1930 in the publication of a collection of these rabbinic protests, Ein Tenai be Nissuin. In response to this collection, Rabbi Eliezer Berkovits defended conditional marriage in Tenai be Nissuin u’v’Get, published in 1966. As well as the interesting and relevant content, the dialogue that these publications contain is a stunning example of divergent understandings of the role of halaka and the relevance of moral agency of the legal decider. Conditional marriage partially avoids the nonreciprocity of the kiddushin. Although the woman is still “acquired,” the marriage is retroactively nullified if the husband exercises his nonreciprocal powers and refuses to give the wife a divorce. Derekh Kiddushin is the other model I address. It also has Talmudic precedent (although applied in a different situation in the Talmud) and refers to an exclusive relationship that is mutually contracted. Rabbi Meir Simcha Feldblum reintroduced this model of partnership in his article (in Hebrew): “The Problem of Agunot and Mamzerim: A Suggested Overall and General Solution.” The article was his response to ethical concerns about the plight of agunot and mamzerim, as well as the alienation from Judaism, especially among Israelis. His article is another wonderful example of halakic creativity that is motivated by ethical concerns. Appropriating dormant legal traditions, such as those mentioned above, in order to align praxis with current moral concerns is an important feminist methodology. In grappling with the non-reciprocity of marriage and the acquisition of the wife by the man, some have opted for a totally renewed model, like Rachel Adler’s Brit Ahuvim. Although I honor her project, I wanted to use an alternative to kiddushin that has its basis in the tradition and transform it in that way. Many others have continued with the acquisition model but departed from tradition by making the acquisition “egalitarian,” for example, through double ring ceremonies in which the woman expresses a reciprocal statement of betrothal similar to the man. My reading of kiddushin as unreconcilably nonreciprocal and in need of utter transformation suggests a radical break from the status quo. 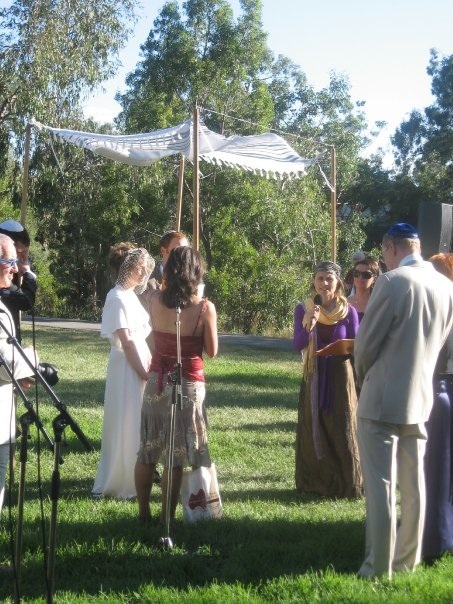 Instead of emphasizing the holiness of marriage and its centrality to Jewish family and Jewish community, it interprets kiddushin as a relationship based on unequal power dynamics that needs to be transformed if it is to serve as the basis for Jewish families. Others have advocated for equal ceremonies, without acquisition, that are still called kiddushin. This approach—of keeping the concept of kiddushin but shifting its meanings—pays tribute to the canon but radically transforms it at the same time. Such a model maintains the rabbinic concept of kiddushin while equalizing its power differential. Mutuality explicitly defies the rabbinic definition of kiddushin. This may be possible and desirable in the long run. But for the moment, I think that a process needs to begin in which both women and men become aware of traditional kiddushin, its implications, and possible ramifications. Orthodox women who value equality also need to take the risk and refuse to participate in traditional kiddushin. At a time of potential union with a beloved, and connection with the Divine, no woman should have to participate in something that is at odds with her deepest values and commitments. Melanie Malka Landau is researcher at Monash University and director of the Or HaLev Center for Jewish Spirituality and Meditation.